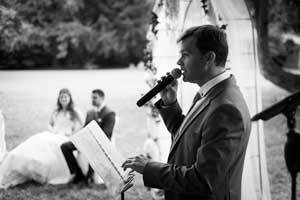 The officiant is a true handler of ceremony, who leads it from beginning to end. After a first meeting with the married ones, the officiant write the ceremony text according to their wishes and personalities. The spirituality of the moment and the general atmosphere of the ceremony are ensured by the officiant, conforming to the married ones. The officiant always acts within the bride and groom wishes, and is perpetually connected to the wedding planner. Note : a celebrant is not a wedding planner, and a wedding planner is not a celebrant ! The wedding planner organizes the “a-sides” of the wedding before, during and after the ceremony (decorations, welcome of the guests, speakers, music at the right time…). 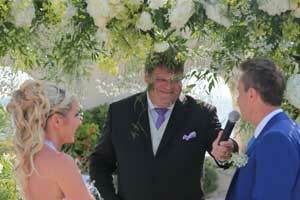 Invisible, he completes the officiant and managed the unexpected, the providers and of course the guests. 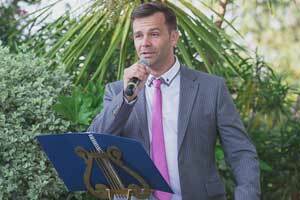 We have many different celebrants, each has a speciality : style, language… Some can interacts with the musicians of the event to sing the song of your choice for example. Please do not hesitate to contact us to know more about our officiants.